This is a picture taken June 6, 1936 in the cemetary at Winchester on decoration day. George Dellinger, formerly of Company D, 23rd Virginia Cavalry, sent this photograph to the Hagerstown (Md.) Historical Society in response to a US Antietam Celebration Commission questionnaire. The Commission organized the commemoration of the 75th anniversary of that momentous battle at Sharpsburg, Maryland on 17 September 1937, and had canvassed surviving Civil War veterans for their memories and present circumstances. This and other photos, along with letters of reply from many of the veterans, are now online at one of two new exhibits created by the folks at the Western Maryland Historical Library. I am in receipt of your communications of March 20th and thank you for it, and will be glad to do anything I can to aid you in your Laudable endeavor, unfortuneately however I was a Prisoner of War at the time the Battle of Antietam was fought. I will not bore you with more of my Army life farther than to say I participated in all the battles of the army of the Potomac that the 2nd Corps did from Gettysburg to Appomatox. Wounded at Gettysburg slightly, never sick a single day in the three years, always with my Regiment, enlisted as a private at the age of 15 and a half. and at the age of 18 and four months Sargeant Major of my Regiment. and this day the 23d of March 1937 I am 90 years and three months of age, I'm very good physical health. I have written a long letter for me. and I hope I have not bored you with my clumsy narrative, I would like to join you on the occasion of your Celebration. but fear I will be unable to. In conclusion let me say that I have visited the Battle Field of Antietam in 1911 and 1912 I was stationed at Newport News VA, supervising the building of two submarine boats for the government and I drove from there to Bridgeport and passed through the Antietam after Dark. Against the horizon I saw monuments and was sure it was Antietam. I drove to Hagerstown where I spent the night, and in the morning drove back and spent the morning going over the field, trusting you will overlook errors and mistakes or change them to the penalties of old age! I am very cordially yours. The second exhibit from WHILBR is a collection of clippings and other ephemera from a scrapbook compiled after the 1937 Battle Anniversary celebration by the Hagerstown Chamber of Commerce. Among these are the Hagerstown Morning Herald‘s coverage of President Roosevelt at Sharpsburg. 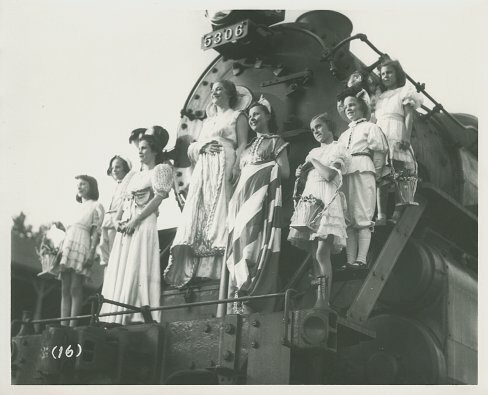 Another gem is this picture of Miss Antietam, Julia Brandt, and her entourage posing on a B&O Railroad locomotive at the fairgrounds, site of the “On Wings of Time” Pageant. There’s much more. Go see for yourself. Thanks to the Western Maryland Public Libraries for putting up some fascinating collections, and to Jill Craig for letting me know about them. They’re doing some marvelous work in digitizing and displaying a wealth of local history and deserve our support. Have you seen a photo with FDR flanked and holding hands with a Union and a Confederate soldier? I’d like a copy. 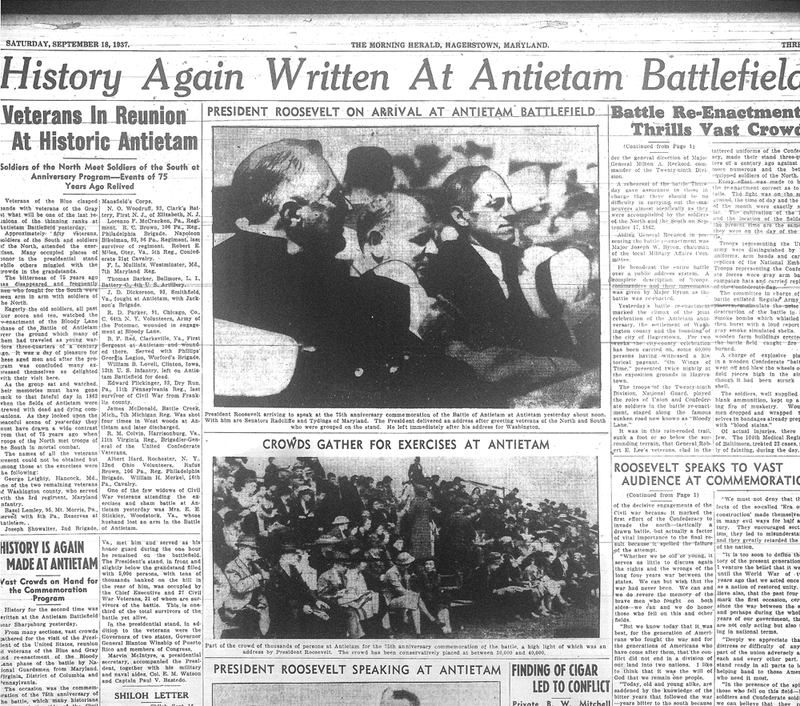 President Roosevelt spoke at the 75th anniversary commemoration of the battle field of Antietam, near Hagerstown, Md., site of the bloodiest single battle of the Civil War. He greeted members of both armies, prior to the ceremony. Left to right are Corporal Basil Lemley, 94, former Union soldier, Captain Robert E. Miles, 98, former Confederate officer, and the President. I know Roosevelt also visited the Gettysburg reunion of 1938. There may have been similar photos taken there. The Horse Soldier has a nice write-up and some photos online on that event. 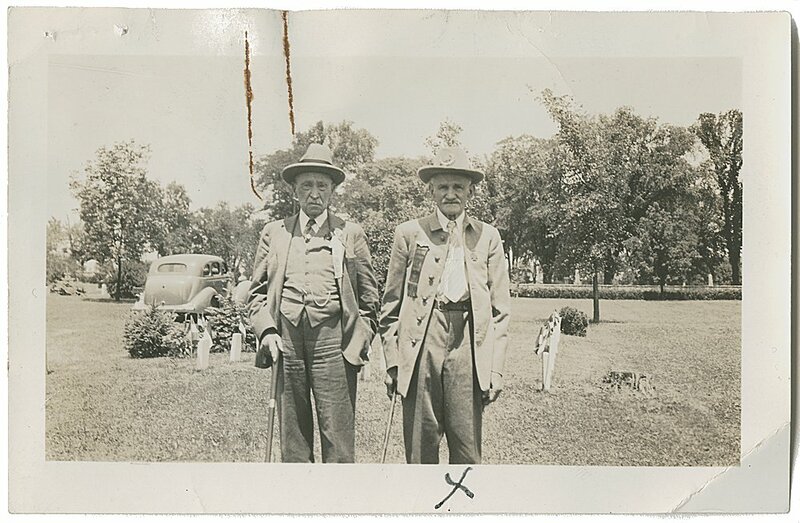 Good photos of FDR in 1938,and another of the Union soldier but none of Miles. I guess most of you know that the 21st was ordered by McCausland to start torching Chambersburg July 30, 1864, but Colonel W.E. Peters refused. Was apparently put in irons. But, several of the 21st were wounded or caught there or near there, so they did participate some. Peters was put back in charge near Moorefield when Averell charged in and devastated Johnson’s cavalry Brigade there. Peters was shot through both lungs, recouped, and came back as did Miles. Peters finally gave up at Appomattox, the only member of his old Company K there. Rest were scattered or going home. Gutsy men, but sad that it all happened. Thanks very much — this is great stuff — and best wishes on your upcoming book. Interesting photos! CSA Captain Robert E. Miles was my great, great grandfather. Three of his daughters married Sisson men. One of those ladies was my great gradmother, Leona Miles Sisson. Grandaddy Miles lived to be 102 years old & was buried in his Confederate captain’s uniform. Hi Sam – thanks for adding in! Hello Sam! We must be cousins as Robert Miles was also my Great Great Grandfather! I’m from the Cora Miles/John H. Sisson line. My Grandfather was James Carlyle Sisson. 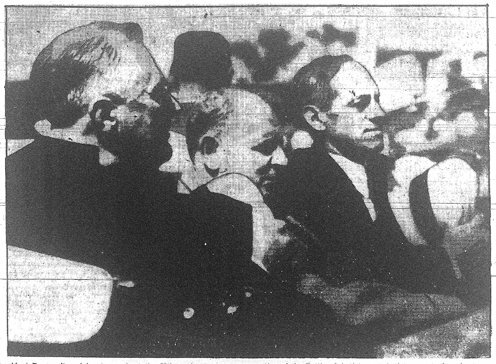 I’ve been trying to locate a better copy of the photo with him and FDR at the 75th Anniversary. All I have so far is a photo copy of the newspaper print and it’s not so clear. We have dedicated a wall in our home to Antietam and want a good picture of him on it! Cheryl, the only copy we have of the photo is in a geneology book on the decendants of Ludlow Branham Sisson produced by Siebert Sisson in the 1960s or 70s. Hello. I am Cheryl Sisson Vincent’s father, Duane Sisson. James Carlyle Sisson was my father. I recall a visit at Great Grandfather Miles’ home when he was in his mid 90’s. The thing I remember is he thumped me on my head with his stumped finger that he had lost during the Civil War. Anyone that has other memories, pass them along! Maggie Sisson Poff was my great grandmother. I have pictures of Robert Miles’ 100th birthday. Duane, I think I even have a picture of your father in his younger days! My name is Jimmy M. Sisson and I am a gr-grandson of David Sloan Sisson, so I think all of you who posted are my cousins. My grandfather was Lindsay Elmer SISSON. Robert MILES is important to SISSON history, as 3 of his daughters married SISSONs. This is a great picture of him. If anyone would care to share any pics of their SISSON family, I would love to see them. Sonia, I just saw your blog to my father! Would you be able to email any of those Miles’ birthday pictures? Our family would love to have them! Last year, we visited VA and found his old homestead. Having read only a few of the above posts (so far), I feel compelled to add my name. My mother is Roberta Miles (Sisson) Beverly. My mother’s mother is Clara Katharine (Sisson) Sisson. “Kate,” as she was known, is the daughter of Cora Jane (Miles) Sisson and John H. Sisson. Kate remained a Sisson after marriage because she married Asa Branham Sisson, Sr. John H. Sisson is the son of Captain Robert E. Miles. The above picture from the 75th anniversary of the Battle of Antietam was also printed in a Newsweek magazine. Years ago, I found and purchased a copy of that magazine on eBay but I gave the magazine to my brother and do not remember the issue date. Hello Robert E Miles is also my Great, Great, Grandfather my Grandmother was Sadie Sisson Who married Marvin Parks Sr. My dad was Marvin B Parks Jr. He was from Roanoke and used to tell me stories from his Great grandfather about the Civil War. Sadie was one of 13 kids I was just looking a bunch of pictures of the Sissons and Miles clan. Robert E. Miles is also my great, great grandfather (Liona Miles Sisson, Robert Madison Sisson, Annabelle Sisson Vaden). 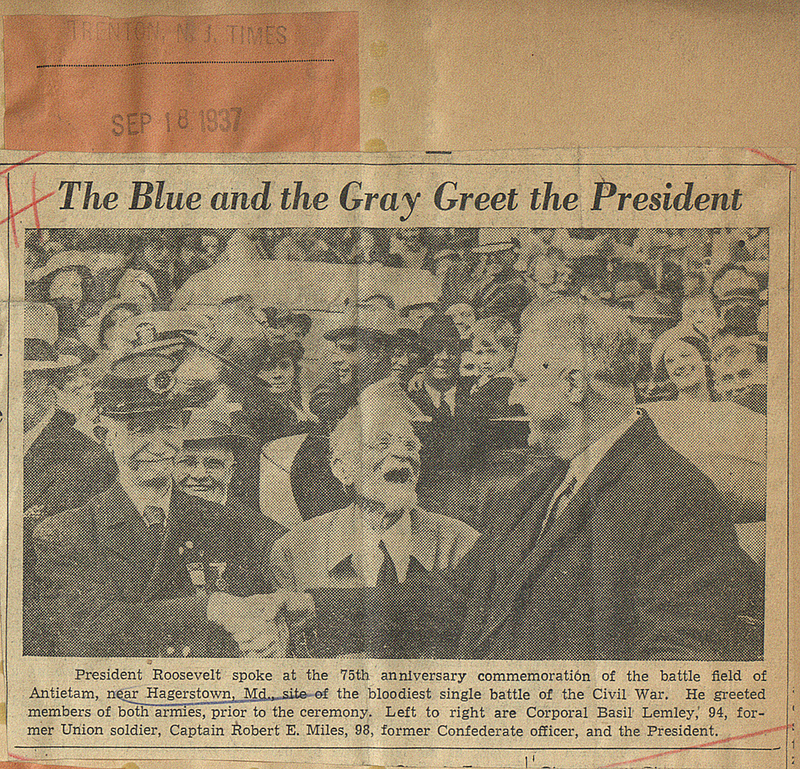 I have a few original newspaper clippings of Grandpa Miles including the one with Roosevelt on the 75th anniversary of Antietam. He was 98 and also have his obituary. He would have been 103 in 2 days. I will be happy to share copies of what I have. There is usually a Miles-Sisson reunion at the Piedmont United Methodist Church at Camp Altamons near Shawsville every 2 years. I have not received any information this year but it is the Sat. after July 4th (July 6th, 2013). Dear cousins – I’m also linked to you via Robert E. Miles – he was my great great grandfather as well. John Arhtur Sisson was my grandfather, and Calvin Sisson my father. I have a book about the Sisson family that I will locate to bridge the connection more. Great to connect with you! Howdy, cousins. I’m related through Abigail. I’m a Lucas. I don’t really know how I found the site, I just kind of tripped over it. I’ve been to Captain Miles’ grave many times. My cousin Bobby Lucas said he sat on Captain Miles’ lap many times and heard about the war and saw his wounds. He was named after him…Robert Edwin Lucas…his great grandson. I would love to know how to get to Captain Miles’ old homeplace if anybody could post the directions or send them to me at lucas_steve@verizon.net. By the way, if you want a good photo of Captain Miles with Roosevelt, go to the Roosevelt Library site. I ordered one through them and they sent it right away. I bought all of Capt. Miles medals as offered at Ebay’s. I did not buy the buckle because the seller could not verify it’s source. Currently I do Research on Capt Miles and have a few Pictures of him with Roosevelt. I will visit his grave next year and plant a small confederate flag on his grave. Wouls apprechiate all Information available on the Capt. Gerhard, there might be a little additional information at the link below. John Banks, the author, is an excellent researcher, writer, and sports enthusiast. I too am related to Robert E. Miles somehow, My mother was Ethel I. Scanlon and her dad was from Baily family. We would visit our Uncle Erby and Aunt Lilly (?) up the mountain in Shawsville,Va.Robert E. Miles lived with them and at the time of his death. Before my Mom passed we drove up the mountain and my Mom pointed out where the farm use to be. I told her I had bits of memory of going to his funeral. It was a cold day and after the service, we drove to the top where he was laid in the cemetery. I am the youngest of three boys, my brother remembers Robert E. Miles and going to see Uncle Erby and Robert living with them. While visiting a few months before Roberts death, My oldest brother “George” who is deceased asked our uncle Erby why the old man was not going with us out in the pasture (hillside) to get the only milk cow in for the evening? Uncle Erby said he was getting too old to walk the hills. Now it is very hard for me to know I had these tid-bits locked into my memory bank at such a young age. My Mom did verify that all I remembered was true. About six months after his death they auction off the farm and I remembered that too.